During disc prosthesis surgery, the affected disc is replaced by a flexible synthetic disc prosthesis between titan mountings. 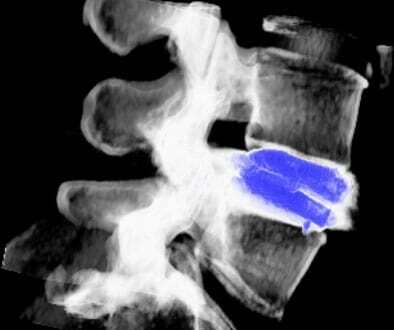 This disc prosthesis is fixed between the vertebraeso that normal flexibility of the adjoining vertebrae remains. 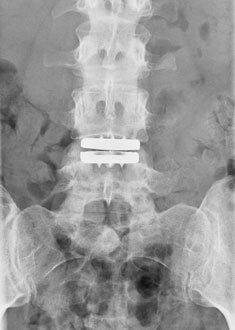 A good indication for the implantation of a disc prosthesis in cervical spine is the existence of a single slipped disc or wear in only one segment. An artificial disc replacement (ADR) in lumbar spine is recommended if there is no slipped disc but a painful and loadable disc, and if neither an abrasion nor a stiffening is primarily useful. If back pain remains after disc surgery, a disc prosthesis can be appropriate, too. Artificial disc replacement surgery (ADR) necessitates general anaesthesia and lasts about 2 hours. The risk of a damage of the spinal cord is minimized by a small anterior access through the soft tissue of the throat for ADR in cervical spine or through an anterior abdominal access for ADR in lumbar spine. During disc prosthesis surgery, the complete disc is removed and replaced with a flexible synthetic core, which is fixed between adjacent vertebrae. 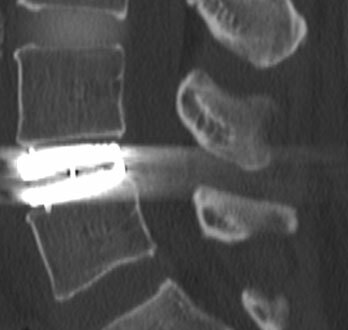 The image on the right top shows a CT image of an artificial disc in lumbar spine, the rmiddle image the same disc prosthesis X-rayed and on the image below a CT reconstruction with coloring. The depictions visualize the 2 metal parts of the artificial disc between which the flexible synthetic core is fixed. Walking is possible only a few hours after surgery. Merely, it is reported about a slight pain. Thromboembolism protection is done medically after the operation for a few days. 2 (cervical spine) to 4 (lumbar spine) days later, most patients can go home. Subsequently, they have to wear a soft brace for 6 weeks in case of ADR in lumbar spine. After recovery of scars, driving car and biking is permitted. After 6 weeks, the prosthesis can cope with every strain. The success rate, a good indication provided, amounts 85-90%. The complication rate is very low. Because of this two facts, common alternatives like stiffening with plates, bone grafts or cage are decreasingly used.